When we think about where the highest ski resort on Earth lies, visions of Switzerland, Austria, France, & Colorado fill our minds. Reality is strikingly different. 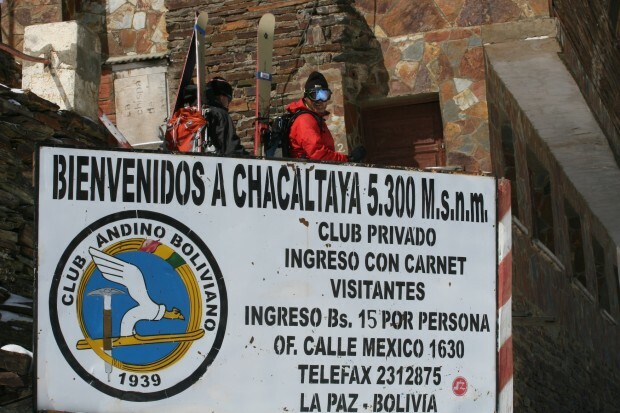 The highest ski resort on Earth lives at only 16° south of the equator in the South American country of Bolivia and is called Chacaltaya (bridge of ice in the Aymara Indian language). What Chacaltaya lacks in latitude, it makes up for in elevation. The ski area summit is located at 17,785-feet (that’s higher than the Mt. Everest base camp). 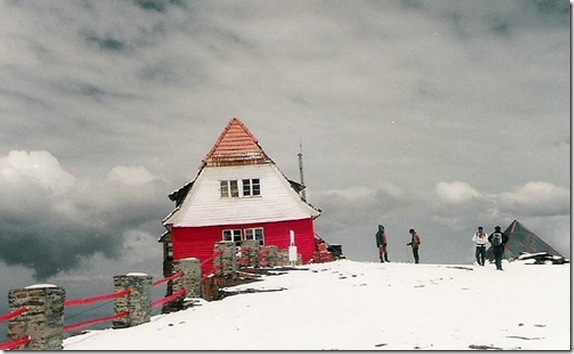 Chacaltaya ski resort was originally created to allow good winter snow skiing from November to March every year. The lift was only open on weekends due to the extreme cold of the area. Summer glacier skiing on the 18,000-year-old Chacaltaya glacier was possible before the glacier completely melted away in 2009 (6 years before its estimated demise). 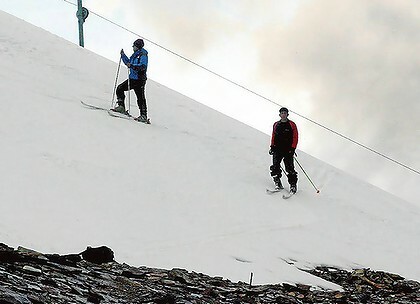 Big, snowy winters are the only thing that can get Chacaltaya ski lift spinning nowadays. Chacaltaya ski run in March 2011 after the glacier had completely melted away. 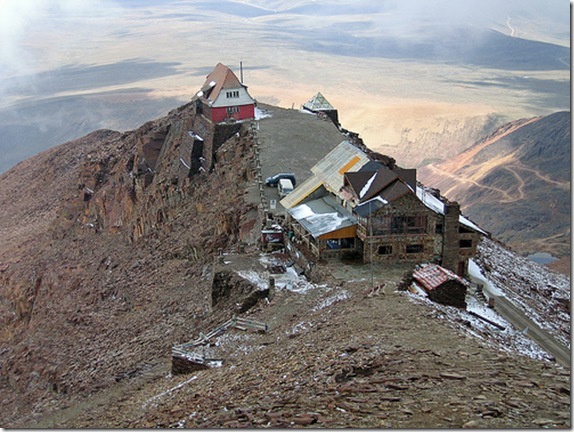 – Chacaltaya is a popular destination for “mountaineers” as you can drive your car right to 17,115 feet. 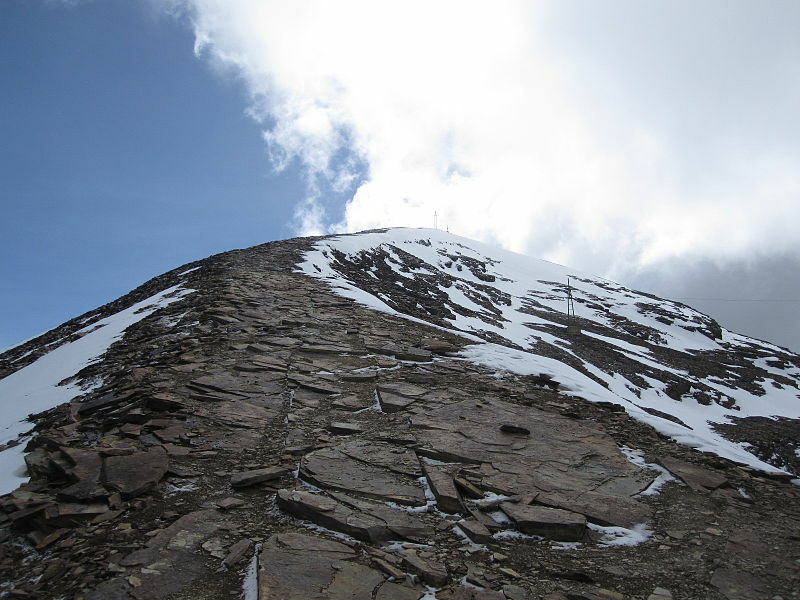 Then you simply hike the final 600+ vertical feet right to the 17,785 foot summit of Chacaltaya. This is a big concern as the majority of the population in the arid Tropical Andes survives due to glacier meltwater that fills their rivers and streams. Once these glaciers are gone, there will be no water for local populations to survive on. It’s very sad that this ski resort doesn’t run consistently any longer. 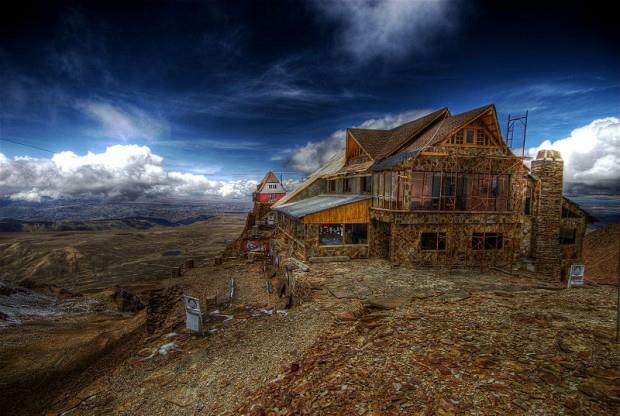 How cool would it be to cruise down to Bolivia and rip laps at the world’s highest ski resort? 17,785-feet is a helluva lot higher than most of us will ever ski. I was in La Paz last year and saw this mountain. Almost went to check it out. Sounded cool, but depressing. Went there. Cool old buildings. Hard to believe you could ski there. This really would have been a cool experience. Guess we need to start thinking about what we are doing to our world? Nah. Let’s just continue to burn it all down. Bring your own Oxygen ! I backpacked around the world for a year, after college. We were lucky enough to visit Chacaltaya when it still has snow, and we skied it. It was about late February, I think. I remember it was quite blustery, and certainly no lack of snow – which I remember was quite dry and powdery. I ripped my glove on the rope tow, but coming from Colorado as we were at the time (along with the coca mate’ they gave us in the hut), that didn’t faze me. We skied tons, though the only photo we took was one I grabbed of the modest hut, perched on a rocky cliff. That picture was nearly my only memento of the place, pre-internet. Sadly, now so much coverage of the place is about its snow loss. Chacaltaya was a rad place to ski – I hope we haven’t seen the last of it. shapes. anyone could freely pass through its dozen or so wide gates. of wealth and sophistication throughout history. … and we reached there by cargo ship, the RONSARD from Liverpool to Buenos Aries, then busses and trains via Jujuy to La Paz, then a borrowed Toyota Landcruiser for the last leg…. No, I bought my first video recorder in ’87, 11 years after leaving Bolivia. I do have some colour slides of Chacaltaya which I will dig out and scan sometime…. most memorable was passing a Bothy half way up, with sack-cloth covering the windows, and a party running down the mountain (at about 16,000ft) carrying a coffin made of corrugated iron! I skied here in 1984. It was great! They gave me the longest skis they had, an old pair of Dynastar 185s with a huge chunk of edge missing. You had to carry a rope with a big metal hook to use the tow rope. Get to the top and tie it around your waist. Cable entered a hole in the wall of the little red building, went around a wheel on an old car chassis then out a hole in the other wall. I was there with maybe a dozen locals (I’m from Tahoe) and I flat tore that place up! Had to watch out for the odd cravass, but had a killer time. Did 12-15 runs, crawled into the back of the taxi and passed out from lack of oxygen. Woke up in town a couple hours later. Gato, whoa, really? You skied here? Could you tell us more about it? Do you have any photo? If so and you have time, please shoot us an email: contact@snowbrains.com. thanks! I’ve got a couple photos and the original “ski ticket”. I’ll see if I can get you copies. November-March is summer in the southern hemisphere. 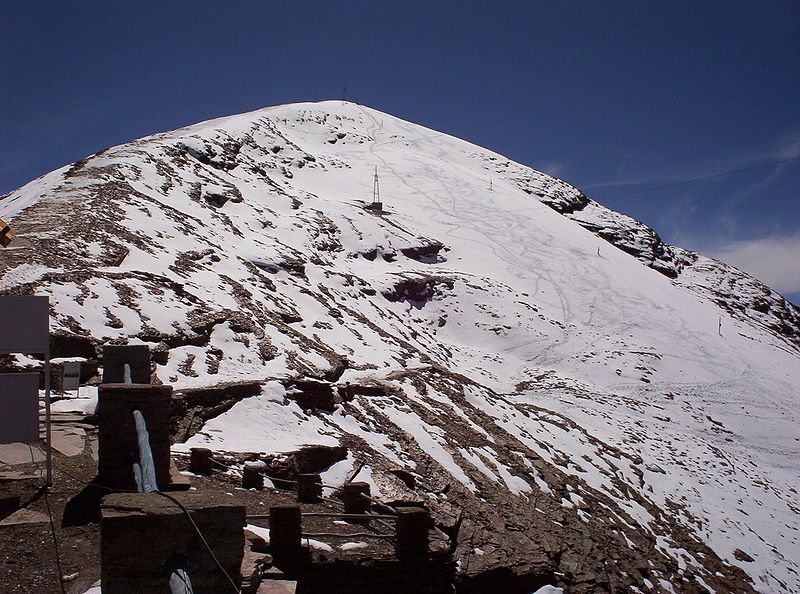 However that’s probably when it snows at Chacaltaya because that latitude has a summer wet/winter dry climate. Amazon deforestation causes a significant decline in local precipitation and is likely the primary cause of glacial retreat in the low latitude Andes. I live in Bolivia. I was in Chacaltaya 3 times. The 1st time in 1980 or so: lots of snow and people skiing and having hot drinks in the cabin. 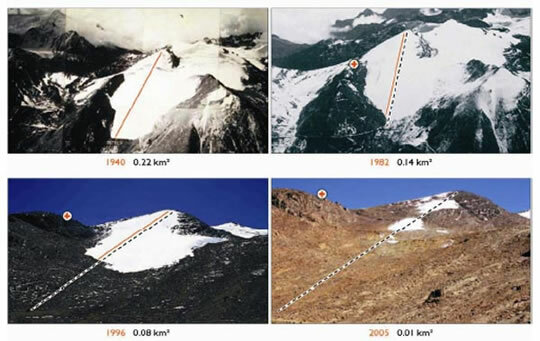 2nd time in 1995: almost no snow, only some ice where people used to ski; glacier leftovers, I guess. 3d time in 2013: almost no snow, only rock where the glacier used to be. But, the view of the city and surroundings is breathtaking. There are not many places where you can get to such altitude (5,300 m) on a car. I highly recommend the trip. I and a buddy had this entire place for ourselves on a weekday in 1989. We came by La Paz on our 18 month trip through Latin America and went up even though we knew it was closed. We gave the guard / caretaker about $50 and he gave us rentals and started up the old diesel truck and let us have the whole place for the day. It was probably the most special day of skiing I’ve ever had. Very sad to see it go! Setting aside the missing question mark at the end of this sentence, who would even suggest doing the very thing (“cruising down” – no doubt in an airplane) that contributed to the demise of the glacier in the first place? Is the author really that oblivious? Way to set an example! Good grief. Well, I read that deforesting in The Amazon creates much less rain and snow in the area. How can a European come here without using a plane? Take a ship ? I was there in sept 1993, no snow at that time. But yes, we had coca tea in the small cabin . I too was at the Chacaltaya ski resort in 1989 and enjoyed a few hours of high altitude skiing! Sad to read of the closure due to glacial retreat. I went off the cliff right under the T-bar tower (which was a vile, dangerous thing) off of Chacaltaya in December 89. The “snow” was a solid ice sheet and the rental skis had no edge whatsoever. In the winter of ’72 (May or June: during summer it snows too much to permit access) a few friends and I took the Bolivian Club Andino’s 4×4 up to Chacaltaya. 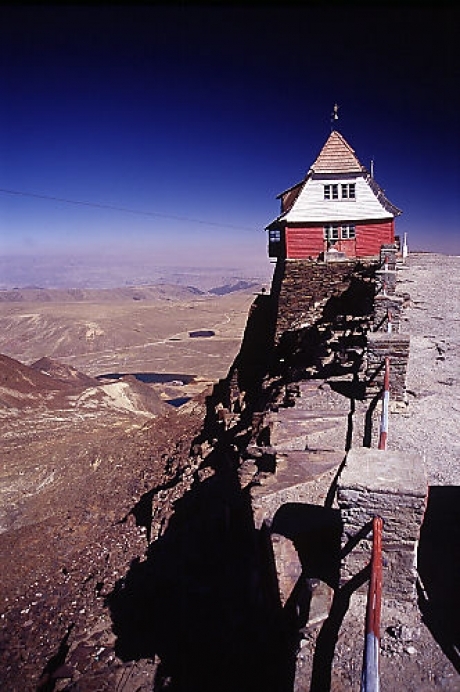 The road up had been constructed to maintain the Observatory for Cosmic Rays operational. I believe it was the highest in the world at the time, and the mere mention of it gave the entire experience an other-worldly quality. I rented a pair of VR17s and strapped on a steel pole that dangled between my knees. This was the device that permitted you to latch on to the cable overhead. The lift was a simple cable operated by (I believe) a 1929 Cadillac motor. The views were amazing but what really took your breath away was the altitude: at each turn you felt your heart pumping out of your ears. The tricky part was at the bottom of the run, where the snow ended abruptly at a steep and seemingly endless pile of scree that descended down the mountain. If you didn’t stop in time you’d end up on the rocks. To catch the “lift” back up the mountain you had to position yourself under the cable very carefully: one ski parallel to the cable, the other perpendicular to the fall line, which held your weight and kept you from falling or sliding back. Then you had to hook the pole (which had a ?-shaped bend at the end) to the cable and, once hooked, quickly shift your weight onto the uphill ski. The jolt of the cable was instantaneous and if you messed up the hook you could be dragged all the way to the top. It was great fun, the snow was decent, mostly a crusty hard-pack, and the enthusiasm and camaraderie of the Bolivian team was absolutely precious. Its loss is perhaps the most poignant reminder of the speed with which the planet is warming. My parents drove the family up there when I was around ten years old. My sister and I attempted to sled on some cardboard. I am now sure how people breathe when skiing. We. were pretty out of breath just playing around. That was when we were living in La Paz at 12000 ft. Great childhood memory. I skied Chacaltaya Easterday 1981. Then we used to have a hook to hang on to the ropetow. Up on the top we released the hook and tied it around our waist and skied down. The engine running the towrope was an old carwreck sitting on a hilltop where the ropewas wound round the wheelrim. When enough people were attached to the rope the guy in the carwreck started the engine and geared up first second and third gear.Up we came. Released our hooks. And we skied down…. Nice easter experience. 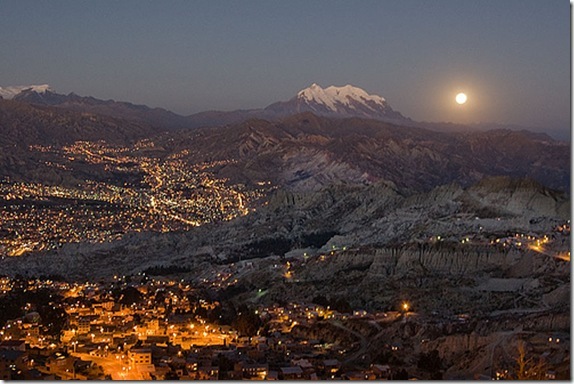 My wife and I were stationed in La Paz in 1995-96. We skied at the Chacaltaya “resort” one day, with friends we met in La Paz (a girl from Hungry and a guy from Switzerland). Steel cable “tow rope” run by a big truck engine, rubble field at bottom, blazing sun, solid stone chalet, big long glacier. (Amazing experience). Yes, the lack of water suitable for drinking is really a big problem for the local population. Global warming is the real problem of today. And it is happening all over the planet. In Antarctica glaciers are also massively melting down, this is due to the active volcanoes that were discovered not so long ago. You can watch for tracking seismic activity there and throughout the world via this link; https://allatra.tv/en/earthquakes. Since the beginning of the twenty-first century, the growth of seismic activity has been constantly recorded under the ice of Antarctica. The climate is changing, and this is already noticeable at a first glance! I filmed a segment for Warren Miller there around 1994. Great people and completely rad environment and setup. Unique. Sad to see that cthe me to an end. No one can deny climate change when we see such dramatic changes in such a short time. Visited here in 2017. Though what most people realize is that it is decreased snowfall, not rising temperature ( at least not directly related) that is the problem. Average temperature has actually decreased during the evaporation of the glacier. Im glad to see some common sense on here, with our weather it’s quite simple really, you know how night is cooler than day, and shade is cooler than being in the sun? The Sun controls how warm or cold our weather is. Even if the greenhouse effect THEORY is correct, it still depends on the sun’s activity. Which Leads me to my next point, WE ARE HEADING INTO A GRAND SOLAR MINIMUM. Go look at http://spaceweather.com who just introduced a measurement of the temperature of our thermosphere called the Thermosphere Climate Index. Start to research and analyze everything, be skeptical of everything, take everything with a grain of salt, else your not being true to the scientific method. Click here for 37% off!